It sure made me happy and proud reading about Marietta Geraldino, a Filipina teacher at New York City’s Frederick Douglass Academy II, who was among the 11 awardees of the Big Apple trophy and $3,500 for their selection as best teachers in New York on June 12. Geraldino, a geometry teacher in 10th and 11th grades was especially lauded by no less than the New York City Department of Education for her ability to deconstruct (simplify) the most complex mathematical concepts and make them palpable (understandable) to even the most resistant students. To be the lone Filipina chosen from more than 2,000 nominations by students, teachers, schools and families is quite a distinction worthy of her 24 years of teaching, the last nine having been with NYC. Born and raised in the Philippines, Geraldino earned her education degree from St. Paul’s University where she majored in math and minored in English. 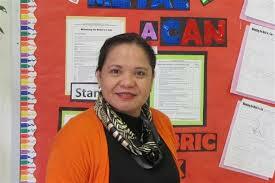 She taught high school and college at St. Paul University Surigao from 1987 to 2003. She also served as the Vice President for Academic Affairs for St. Paul Quezon City’s Bocaue campus. I am sure Geraldino was a good teacher already when she was still here because of her father and her grade school math teacher. “My father taught me things when I was a young child, math especially, in an interesting way. I looked up to him,” Geraldino said in a profile posted on her school’s website. What made her even better through the years, impacting the learning process of her students at Frederick Douglass Academy II, was the opportunity given her and her determination to further improve her skills. Perhaps, Geraldino could be one of the many Filipinos who joined the earlier exodus for a better pay and better future abroad, thus, leaving the country drained of competent professionals, especially teachers. We could not over emphasize the importance of having good, patient, determined and capable teachers educating and guiding Filipino children in school. It has even become fundamentally significant now that the country is embarking on the K+12 education program. The need for government to produce more Geraldinos in our country has never been demanding as it is today with global competition so tough and challenging. As it is, however, PH loss in Geraldino is NYC gain. This entry was posted in Award, Education, International event, International news, National news, U.S. news and tagged Best teacher, Big Apple trophy, Fredericck Douglass Academy II, Marietta Geraldino, NYC, NYC Dept. of Education. No hay de qué (Don’t mention it).